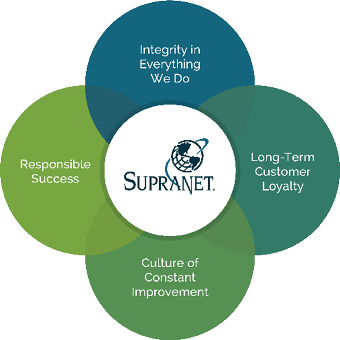 SupraNet competes on relationships, and we constantly strive for long-term customer and employee loyalty. We believe in open and honest communication with our clients and with each other. We work together to build a culture of transparency and constant improvement that leads to strong and trusting client relationships. We do not fear mistakes, we learn from them. We do not shy away from change, we embrace innovation. By helping our clients to succeed and our employees to prosper, we enable our community to flourish as a vibrant and competitive entrepreneurial ecosystem that fuels our collective long-term success. We believe in open and honest communication—and we live up to that promise. Our clients entrust us with their most critical information, and in turn, we work hard to keep that trust. This is especially important in an industry as complex as technology. It is hard to see differences between providers when everything is up and running, but trying to reach a “real person” on the phone, getting a prompt answer to a question, and not getting the run-around can be next to impossible. At SupraNet, you can count on a fast, upfront answer from a staff person you know and trust. The difference is even more pronounced during the inevitable down time. You will always reach a real person. We are always available, and always responsive. We’ll tell you what the problem is, give you regular updates, and work hard to get you up and running fast. It is that transparency, honesty and quick response that our clients have come to expect and appreciate. With an industry as diverse and rapidly changing as the Internet itself, it has become commonplace even for commercial clients to switch service providers on a regular basis. SupraNet is proud of our high client retention rate. Our clients are our partners and we owe our success to them. We are committed to providing them with unsurpassed service, and in turn many of them have been SupraNet clients for much longer than a decade. Many have referred SupraNet to their friends and colleagues – a sign of a true partnership! Our cutting-edge technology, our commitment to providing superior customer service and our unwavering integrity all play a crucial role in our continued long-term customer loyalty. We believe that all processes should be constantly evaluated and improved upon to ensure efficiency, effectiveness, and flexibility. We engage in strategic planning to proactively assess the effectiveness of our initiatives, and look for new ways to add value for our customers. We encourage our clients to give us feedback—both positive and negative—in an effort to provide them with the best quality service possible. SupraNet proactively conducts customer satisfaction surveys, as well as surveys upon completion of trouble tickets. We don’t just collect information; we listen to the voice of our customers and take action based on their feedback and ideas. Our staff engages in ongoing professional education to stay current with new and important developments in the industry. We strive to get better every day and provide extraordinary service and peace of mind to our clients. We have deep local roots in our community, and believe that those roots make us stronger and more competitive. We know too well that without community support we could never have achieved all that has made SupraNet a successful, growing, and competitive business. We believe in giving back to the community, contributing to the local economy, creating new jobs, and doing business in a sustainable, responsible way. We strongly believe in the power of buying local and encourage others in the community to do the same. SupraNet reinvests our profits locally, because we know it makes a positive difference to our clients, friends, and neighbors. We contribute our time and resources to a variety of non-profit organizations, engage in volunteerism, participate in both business and service-focused local organizations, and ensure that we always share our success and its dividends with the community we call home.